World War II is notorious as the most costly conflict, in terms of lost lives, in human history. While there are well known examples of strange Nazi weaponry and unusual American experimental weapons, lesser known are the more bizarre British creations of defense and destruction used to resist the Axis. Some of these machines turned out to be dangerous to those who would use them, while others seemed strange but were successfully deployed. In this account, we review some of the most shocking and little known British wartime weapons and equipment produced — or at least planned — during WWII. Anti-tank, anti-shipping, and anti-personnel mines are all notorious due to their extreme danger and, especially in the case of anti-personnel mines, ability to inflict grievous harm after the end of hostilities. But did you know that for a time in WWII, due to a British engineering project, it was at least possible to accidentally fly into an aerial minefield? During WWII, British engineering efforts culminated in the creation of a bizarre weapon intended for the Royal Navy known as the Unrotated-projectile Rocket Launcher. As weird as its name sounds, the convoluted machine was intended to be used to deadly effect, but was apparently entirely ineffective against enemy aircraft. Upon reaching a sufficient height the machine would explode, releasing a veritable “flock” of airborne mines attached to cables, to snare enemy aircraft and detonate. Firing a barrage of rockets from non-rifled (hence the term unrotated) tubes, the machine worked by having the rockets release the mines and cables. The hope was they’d catch hold of enemy aircraft as they slowly descended by parachute. However, the machines were complicated, taking time to launch. Once launched, the parachutes and lines were obvious and easy to avoid as they descended. Worse yet, the falling contraptions could breeze their way back onto the ships that launched them and explode. What looks like a barrel but can ricochet off water and take out a dam? None other than a bouncing bomb. Invented by British Engineer Barnes Wallis, the bouncing bomb is known for being used to take out dams in Germany during the Royal Air Force Operation Chastise that was commenced in May 1943, and which would ultimately form some of the most memorable WWII history. Defined by great innovation and hazardous bombing runs, the “Dam Busters” combined unique engineering and military aviation skills to drop specially designed bombs that would bounce along the surface of the water before detonating and taking dams with them. The entire system was very complicated, but the mechanism was based on the behavior of a very simple shape. The barrel-shaped devices were spun via a belt apparatus in the aircraft and then released in low level flight, where they would bounce across the water before going off at great expense to the structural integrity of the dam in question. The strange barrel shape allowed them to skip along the water like a wheel before the explosion. Huge four-engined Avro Lancaster bombers were used by the Royal Air Force to deliver the flood-making payloads. Jeeps might be a staple of American military transport, but British scientists working in Manchester actually succeeded in getting something as likely as a pig to fly in the bid to develop a new, novel war machine. Military operations, particularly those behind enemy lines, may benefit greatly from the use of a vehicle suitable for difficult terrain. Yet getting such a vehicle there in the first place may prove to be an unduly dangerous, or simply insurmountable challenge. A technique that involved air dropping Jeeps that would descend like an autogyro was embarked upon to solve this problem. A flying jeep, called a “Rotabuggy” was proposed and constructed in prototype form. Complete with a rotor, the bizarre “hybrid” machine was first tested by being towed by a Bentley, and was able to glide. While further tests showed reasonable performance, the project was abandoned. The intention had been for the contraption to be airdropped from a plane where a Jeep was needed, descending to Earth with the lift of the spinning rotor slowing its fall safely. The project ceased when large gliders capable of delivering vehicles were developed, but the idea certainly shows ingenuity. The project mastermind, Raoul Hafner — who worked with the British Airborne Forces Experimental Establishment — was Austrian by birth and was interned under enemy alien policies in 1940 but soon released when his naturalization process completed, giving him British Citizenship. Stonehenge may be a UK icon of ancient engineering, but much more modern — yet still bizarre — structures are found on sections of British coastline, seemingly from another place or time. Built in response to the growing problems of air raids in World War I, they are concave structures typically shaped in the form of a shallow bowl and up to around 16 feet in height. Standing in old fields and on pond edges along Britain’s coast, the concrete sound mirrors resemble alien artifacts from another place or time. But in fact, the installations were built to detect German fighters and bombers and gain an advantage given the fact that radar systems in place left much to be desired. The dishes would amplify and gather sounds, allowing aircraft to be detected in time for a defense to be mounted. The brainchild of William Tucker, the devices are credited with assisting in the Battle of Britain victory. Known as acoustic mirrors, the devices were in the process of being increased in number through the work of the Acoustic Mirror Programme during World War II, when the project was discontinued in response to becoming obsolete in comparison to rising innovations in radar technology. However, the unearthly looking concrete dishes that appear seemingly out of nowhere at strategic sections of the coast are a testament to ingenuity that remains iconic. A presumed staple of rainforest warfare techniques, poison darts might be the clichéd weapon of tribes living in forested environs. But a lesser known fact is that British weapons development efforts included a bid to build a bomb that would disperse thousands of falling micro-missiles tipped with needles dipped in deadly toxins. While shocking, the project was abandoned before reaching operation. Stemming from 1941 goals of devising means of chemical warfare against the Nazi regime, a plan was hatched in Britain to create a weapon deployed from the air that would essentially rain poisonous chemical filled needles onto German troops in an effort to stop the Nazi advance. 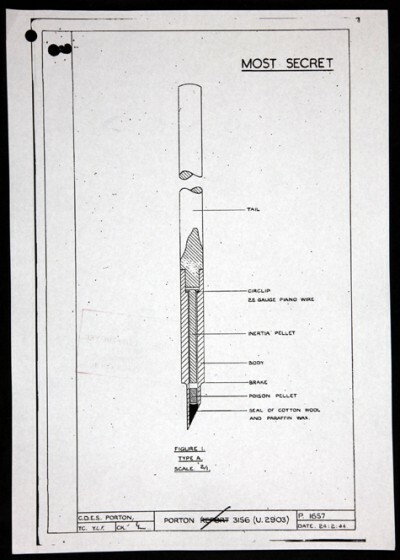 The peculiar project even led to an inquiry directed to the Singer Company, known for constructing sewing machines, which garnered a response indicating that the questions about needles hinted at a use for a purpose markedly different from sewing. The option of dropping deadly needles held some military interest, particularly when the risk of thousands of invading troops was considered. As a result of the inquiries, the Singer Company offered to assist. The bid never reached a conclusion of wartime deployment, being put aside as priorities shifted throughout the progression of the conflict. Enormous and lethal, Britain’s “Earthquake Bombs” were devised by the same Barnes Wallis who engineered the bouncing bombs used by the dam busters. Enormous, built for a highly-specific targeted use, and powerful beyond the capacity of most conventional weapons, earthquake bombs were intimidating just to look at and created an appropriately-sized, monster explosion. Just getting the giant bombs in the air was a challenge, but once dropped, the sheer mass of the weapons, combined with a high altitude drop, meant they did not just fall to the Earth like most weapons. They not only fell, but the very nature of their design and use meant that they penetrated into the ground and would then explode with great force, setting off earthquake-like tremors and collapse. Created in response to the threats posed by growing underground German military operations and concrete-roofed submarine pens used by U-boats, earthquake bombs were dropped by specially modified Lancaster bombers. Two versions, the 21-foot long, 12,000 pound Tall Boy and the 26.5-foot long, 22,000 pound Grand Slam were used. The results were devastating not only on land but also at sea, destroying huge and challenging targets. The sister ship of the famed Bismarck was destroyed by a Tall Boy in a direct hit by one of these giant earthquake bombs. Biological warfare brings to mind released pathogens in more modern times, or the unsavory, but at times effective hurling of contaminated animal carcasses in medieval conflicts. But another twist on animals as weapons includes the exceptionally wily use of the bodies of rodents to not only hide explosives, but to induce disposal in a way that would bring about even greater damage upon being discarded. During World War II, a bizarre plot was hatched by British Special forces that consisted of opening the carcasses of dead rats, filling them with explosives and then getting them into Germany. What was the hope of the crafty operatives behind the strange weapons plot? Well, in this case, truth is stranger (and more complex) than fiction, yet ingenious in its apparent simplicity. The goal was that the dead rats would be discovered lying in or beside beside coal piles and tossed into open fires for quick disposal, creating massive explosions instead of incinerating sources of contamination. Did it work? No, as a shipment of dead rats to Germany was intercepted before agents could distribute them. But, the damage to morale and consternation triggered by the strange discovery was noteworthy. While Spitfires may be famous for their use in the historic defense of Britain in WWII from aerial attacks, lesser known are the peculiar “Sea Fortresses” that were set up in the English Channel as a means of intercepting airborne delivery of attacks against Allied shipping efforts. Standing tall in the English Channel, some a good distance from shore and others closer, right in the Thames estuary, the forts were constructed upon giant stilts, while the bizarre boxlike structures (complete with windows) rested on top. Certain forts were constructed starting in 1941 to float on pontoons and eventually towed into the water, while other forts were constructed from a 1941 project that was expanded in 1943 to create forts on legs built into the sea floor. While designed to limit the advances of marauding forces, the structures themselves might look like the works of an alien invasion. The odd looking forts functioned by allowing gunners to intercept mine-laying activities by shooting down aircraft as they flew above the waves. Some sea forts saw noteworthy combat action successes, including 22 aircraft and 30 V-1 flying bombs destroyed by forts at the Thames estuary following the construction and operation of the forts. However, some of the other installations were fraught with problems due to their construction in geologically challenging locations. D-Day may be best remembered as a bloody conflict that cost the lives of many heroic fighters. Yet it’s also the day that many a freak tank was deployed, thanks to ample advance planning. While conventional tanks might spring to mind as the first choice for mustering a massive invasion force against a Nazi occupation, freakish machines — looking as if tank designers consulted demolition derby organizers and road repair crew operators — advanced in the D-Day Battle for Normandy. Among the most bizarre creations to see battle action in World War II, the strange tanks (known as “Hobart’s Funnies”) included visionary designs advanced by British Army Commander Percy Hobart. A swimming tank was included among the ranks, looking like an enormous dingy crossed with a regular tank, while a specially adapted machine known as the Churchill Fascine filled trenches with bundles of brush wood, making them crossable by tank traffic. Like real-life mechanical monsters, various specialized war machines were spawned, including the “Crab,” which held a spinning drum that wildly flailed chains, cleverly neutralizing landmines as it lumbered into battle. Another of the creations on which Hobart worked was called the “Crocodile,” which was more like a dragon as it spat flames from a mounted flamethrower. The Churchill Ark was a tank that could double as a ramp, hunkering down into place while other tanks drove over the top of it and past obstacles such as shoreline walls. The end result was exotic and effective weaponry. Jet fighters and the RAF in World War II aerial hostilities. The combination might seem unlikely, but the reality proves that jet innovation came earlier than might be assumed. While not truly bizarre, there was a strange-looking aircraft in the arsenal of Britain’s WWII stock that warrants close consideration and recognition for leadership in the Allied war effort. Germany is known for having developed the famed and deadly Messerschmitt Me 262 “Schwalbe” (Swallow) jet fighter that saw combat action, leading to significant attention regarding World War II jet fighter innovation being paid to the Luftwaffe. Yet, a little less than two years after the first flight of the Messerschmitt on April 18, 1941, Britain’s Gloster Meteor had its initial flight on March 5, 1943. The catch up was quick, as the Messerschmitt became operational on April 1, 1944 and the Meteor entered service on July 27, 1944. The Meteor was a twin-engine equipped jet that would have served well in combat settings had it seen greater action in WWII.